It is natural to feel a sense of anxiety when throwing things away, as you may have a sizeable decluttering project or worry about regretting getting rid of sentimental items. When decluttering don’t procrastinate. Try to develop a strategy for approaching your project, criteria for deciding what to get rid of and a system for how to throw things away. Pick a start date and do not move the date unless there is an emergency. Put some enthusiasm into this project planning and definitely turn up your favorite music while you’re doing it. Starting with the easiest room, make a list of each room in your home and the order you want to work on it. Bite only what you can chew because nothing is more demotivating than becoming overwhelmed with a grandiose, unachievable project. If it’s an item you use but have multiples, choose your favorite and let go of the others. For family heirlooms, don’t feel saddled ff you don’t love Grammie’s dining table. Send a photo to your family members and tell them it’s up for adoption. Chances are they’ll love it. If the item has sentimental value, by all means store it. We all have a heart for certain ephemera that’s just too dear to toss. The decluttering process runs much more smoothly if you have a system for how to throw things away. Collect four large boxes and four different colors of sticky pads, putting one sticky note on each box. Arm yourself with a pad of sticky notes in each of the four corresponding colors and simply place a sticky note on it in the color that corresponds to the system. “Keep” (Green): items should be placed immediately in their new or assigned place. “Toss” (Red): items go right into the trash, or into the car bound for a local donation site. “Store” (Orange): is used for items you aren’t quite sure about. “Rethink” (Blue): is reserved for family heirloom furniture that can be reworked with new upholstery or refinished into something you love and works in your home. Deciding what to keep or toss, or even what to call it -- decluttering, downsizing, rightsizing – is always a step toward feeling better about yourself, your home, and your life. The important thing is to be ok with letting go of things that have outlived their purpose to free up space. What you do with that all that space can be rejuvenating. 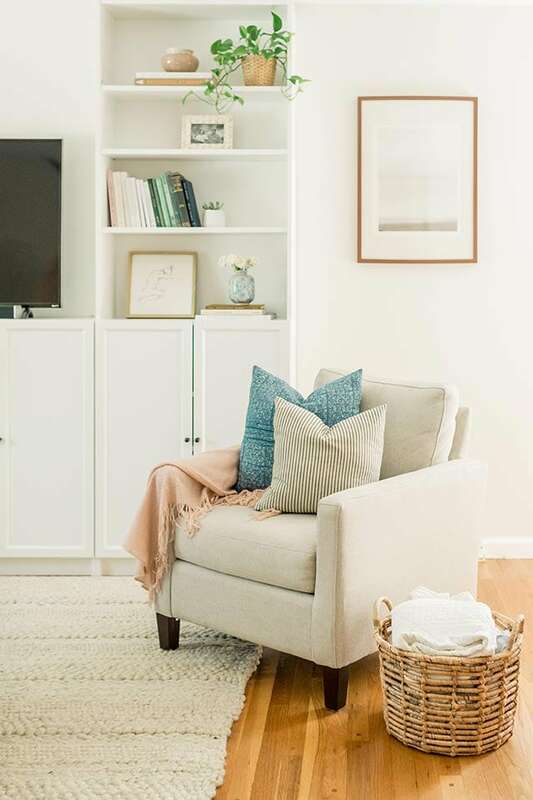 Book an appointment with a Bassett Design Consultant and see how their expertise can help you mix in old favorites with new favorite Bassett pieces while creating a space you love. Create a Wishlist or Order a Catalog to start dreaming today.